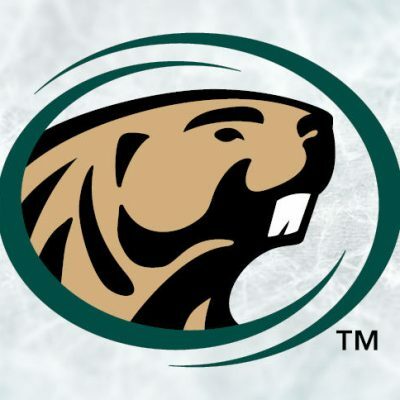 GRAND FORKS, N.D. — Denver entered Thursday’s NCAA Frozen Four game averaging 21 shots on goal per game in the playoffs (league and NCAA). 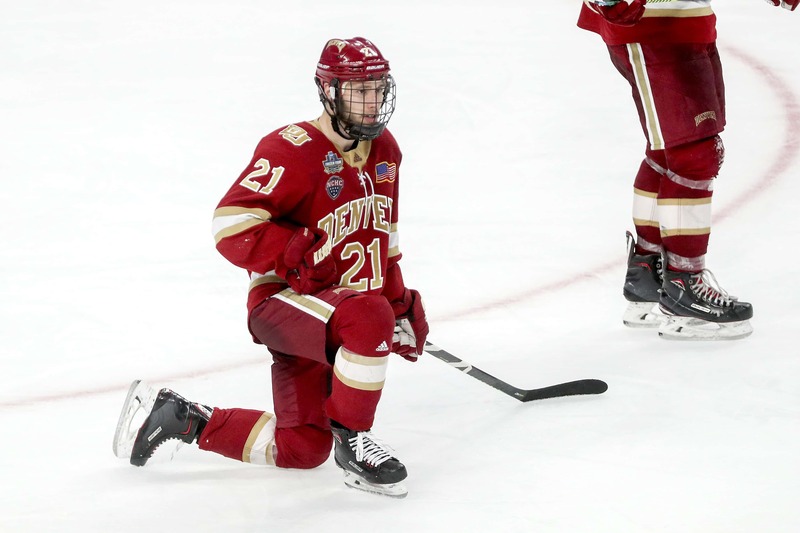 Of the 55 college hockey teams that participated in playoff games this season, only two averaged fewer shots in the playoffs than Denver — St. Lawrence and Alabama Huntsville (who finished 58th and 59th nationally in win percentage during the regular season). The Pioneers survived on stingy defense and the exceptional goaltending of freshman star Filip Larsson to get out of the first round of the National Collegiate Hockey Conference playoffs, reach the NCHC Frozen Faceoff, take the NCAA West Regional in Fargo’s Scheels Arena and earn a trip to Buffalo for the Frozen Four. 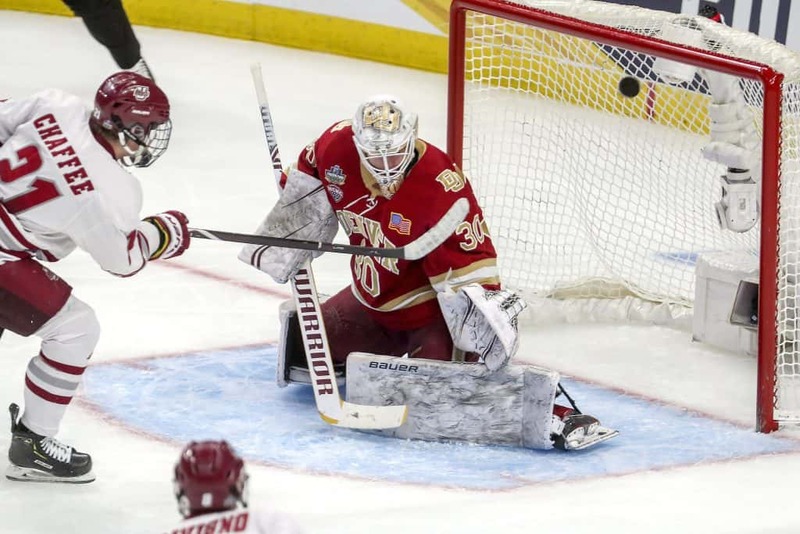 With the exception of the meaningless third-place NCHC game against Colorado College, Denver entered the Frozen Four having been outshot in every playoff game. North Dakota did it by more than a 2:1 margin (74-35 for the two-game series). Minnesota Duluth outshot the Pioneers in the Frozen Faceoff semifinal game. Both Ohio State and American International outshot Denver in the West Regional. That’s why it was a bit surprising to see how Thursday’s Frozen Four semifinal against UMass played out. Denver lost the game 4-3 in overtime, but dictated large parts of it, especially in the third period (after totaling two third-period shots combined in two West Regional games). Yes, the Pioneers were aided by having two five-minute major power plays in the first and second, but even so, at five-on-five the Pioneers were able to generate far more offense than they had in previous playoff games. Denver outshot UMass 40-28, marking the first time that the Pioneers outshot an opponent by double digits since a game against Miami on Feb. 23. Even more surprising, Denver did it without one of its top offensive-producing forwards, Emilio Pettersen, who missed his first game with an upper-body injury. 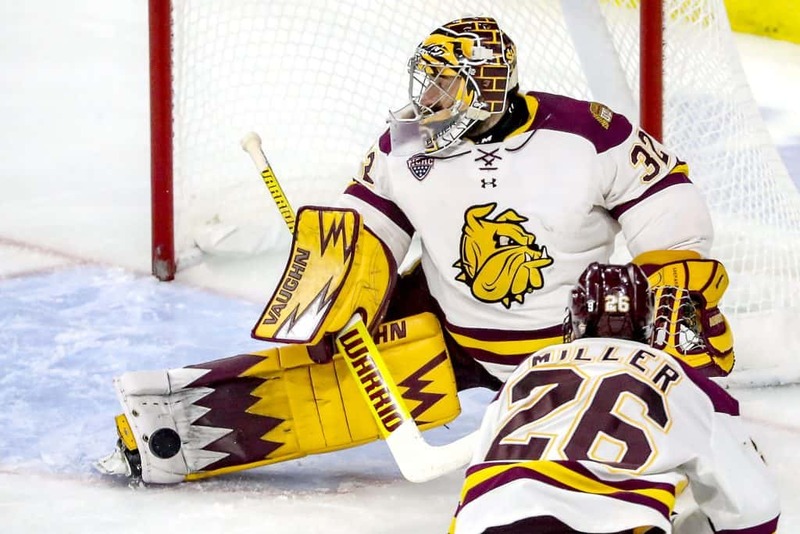 UMass will now take on Minnesota Duluth in Saturday’s NCAA national championship game, but it will have to play significantly better than Thursday if it wants to dethrone the reigning NCAA champion Bulldogs. For the second year in a row, Minnesota Duluth is proving to be nearly impossible to score against. Going back to the first game of the West Regional in 2018, Bulldog goalie Hunter Shepard has only allowed one even-strength goal in 430 minutes, 49 seconds of standing in the net during NCAA play. That’s one even-strength goal in enough time to span more than seven regulation games. This season, Shepard has allowed two even-strength goals in seven playoff games — one to Omaha’s Taylor Ward in Game 2 of their first round series, roughly a month ago, and another to Bowling Green’s Brandon Kruse in their first-round regional game. Because of this stingy defense, perhaps it’s no surprise that if Minnesota Duluth scores the first goal of the game, it is nearly impossible to beat. The Bulldogs are now 28-2 when scoring first since March 3, 2018. Considering all of that, the recipe for Minnesota Duluth seems simple: Stay out of the box and continue making it impossible for opponents to score. UMass’s recipe is much more complex: Get an early lead, stay out of the box, somehow find a way to beat Shepard at even-strength and dictate much more of the game than it did Thursday. In a rare move, the NCAA Division I Men’s Ice Hockey Committee, which handles suspensions in the NCAA tournament, suspended key UMass forward Bobby Trivigno for the national championship game. The suspension is for an elbow to the head of Denver’s Jake Durflinger during the third period of Thursday’s semifinal game. The hit was not penalized during the game. 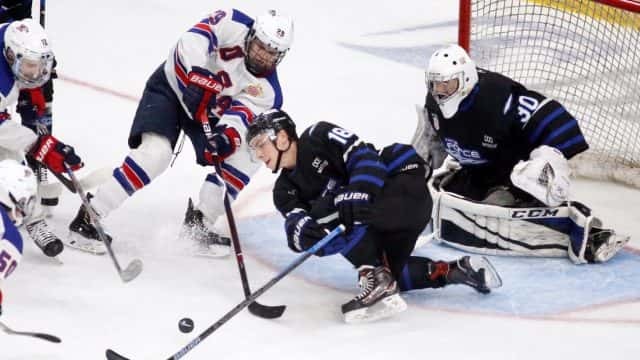 The Western Collegiate Hockey Association officiating crew opted not to review the hit, and Denver coach David Carle opted against using his coaches challenge to force the officials to review it. While it is extremely rare to see suspensions in the NCAA tournament, the Committee was left with little choice because of the egregious nature of the hit. Trivigno left his feet, targeted the head and made direct contact. Prior to Trivigno’s hit, UMass already had two players ejected from the game for contact to the head majors. Trivigno had 13 goals and 28 points in 39 games this season for UMass. The city of Buffalo apparently is not a hit with college hockey fans. Chris Dilks of SB Nation reported that the semifinal attendance of 13,051 in Buffalo’s KeyBank Center was the lowest since the 2000 Frozen Four, which was held in Providence’s Civic Center (which has a capacity of less than 12,000). Those who attend the Frozen Four are generally college hockey fans from across the country — some from participating teams, but many from fans who make it an annual trip. The Frozen Four has never counted on local hockey fans. This year’s Frozen Four may force the NCAA to give more consideration to destination cities like Tampa than traditional hockey markets. That appears to be what the fans want. That being said, the next two Frozen Fours are already set in Detroit and Pittsburgh. 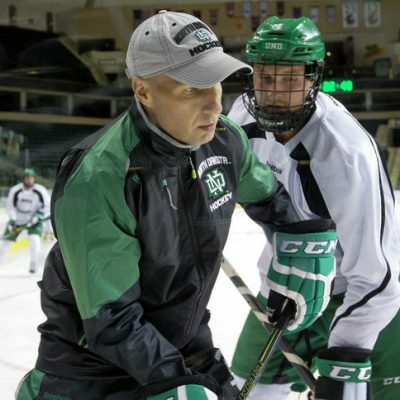 Another college hockey standout has decided to return for his senior season. 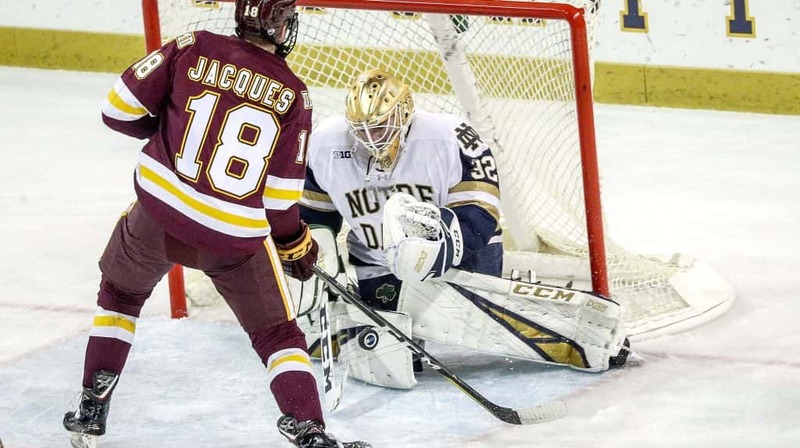 Notre Dame goalie Cale Morris, an undrafted free agent, announced Friday that he will return next season. Morris has remarkable career numbers: a 2.07 goals-against average and a .938 save percentage for the Fighting Irish. Former Roseau (Minn.) High and Minnesota standout defenseman Aaron Ness has been named a second-team all-star in the American Hockey League. Ness had an outstanding season for the Hershey Bears, the top minor-league affiliate of the Washington Capitals. Ness tallied 51 points in 69 games from the blue line, second among AHL defensemen. Ness is scheduled to become a free agent this summer.